Travel St. Lucia Flags, Symbols, National Anthem etc. The flag of St. Lucia was officially adopted on March 1, 1967. The blue field represents the Caribbean Sea, and the triangles symbolize the island’s famous Pitons – the twin volcanic peaks. 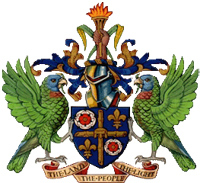 The St. Lucia Coat of Arms is an amalgamation of different symbols. The Tudor Rose represents the English influence on the island. The Fleur de lis represents the French influence on the island. The small brown stool in the center of the shield is a symbol of the African heritage of the people brought to the island. The torch is a beacon to light the path to the future. On the ribbon below the shield is the national motto, “The Land, The People, The Light”. 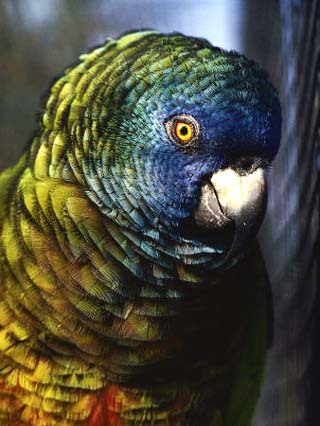 The shield is held up by two St. Lucia parrots.